26 games into the season, the Mets are 16-10, but coming off the back of three straight series defeats. They even forgot to score in the last couple of games. It’s easy to predict the best when a team flies through a 10 game winning streak. But now I wonder how many Mets fans are predicting the worst. So I’ve got a challenge for you. Come on… predict how many wins they’ll get. You’ve got the comments section below to do it. Sure, Michael Cuddyer robbing Zimmerman’s home run was great… but what about his lack of range on those couple of doubles? The Dude is hitting lefties and (mostly) righties… but then he chased ugly pitches in the dirt. Wilmer was benched and then Tejada proceeded to do his best Wilmer impersonation by jumping over a dribbler down the middle. Goeddel continues to pitch straight up and down and not side to side. Gee was saved by everyone’s favorite puffy hatted man, Alex Torres, but surely he’ll be traded soon. Will Dilson Herrera hit? Will Daniel Murphy stop posing after every swing and actually run towards first base straight away? But will Harvey every lose? And will Juan Lagares keep hitting so well? Urgh… Come on, let’s figure this out. So do it now. Predict the Mets’ win total in the comments section below. You can be a hero in five months time. I’ll arrange a little prize for the winner too (a Keith bobblehead?) and also feel free to berate me if I get my prediction wrong. Mets’ fans are intrinsically pessimist. It’s a natural progression from watching far more losing seasons than winning seasons. It’s a sort of mental security blanket. In a street fight, Mets’ fans would always win because we’ve been through the rough times. And then rougher times. Long time readers of MetsToday will remember the commenter going by the handle “Izzy.” He was someone who fascinated me. Izzy relentlessly complained about his favorite baseball club. The comments were always negative and terribly phrased. Everything Izzy typed seemed to have genuine anger. Steam must have coming out of his ears as he pounded the keyboard. He hated Terry Collins and wasn’t fond of a bunch of Mets players. And he really hated Omar. Who was this man? Was he searching for love or acceptance? Or was Izzy – like so many who comment on the internet – simply a normal guy who uses the anonymity of the web to release their inner negativity? Izzy had a mean streak – I can’t even quote some of his lines – and his complaints were undeniably masochist. But that’s not atypical for a sports fan. I equate the love for sports’ teams with parents’ extreme love for their children. Their (usually troll-like) baby is the most wonderful thing in the world. But their (usually not-too-bad) rebellious teenager is Satan incarnate. It’s love or hate bundled up with the need to control. The New York Mets were Izzy’s teenage son. He desperately kept telling them what to do, but they kept doing something else. He never doubted his wisdom… he had been there and he had seen it all. I joked once that he’d travelled back from the future in a Delorean car, such was the intensity of his predictions. Since I am a half-glass full of alcohol kind of guy, I wanted to challenge Izzy to a prediction battle but he whizzed off in his Delorean into the mid-80s and is winning millions using his 1950-2000 Sports Almanac. My own prediction comes at a cost. Each year I bet £10 of my hard earned teacher money on how many games the Mets will win. I get a little bit of a spread (3 games) and I have one tactic. Before the first game of the season, I bet the Mets will win 4 more games than the majority of Mets’ fans think they will. It’s worked more than it hasn’t. I’m not advocating gambling but I gamble once in a year in legal way and continue to ruin my Hall of Fame eligibility. This year I bet my £10 on the Mets winning 86-88 games. And I’ve just found the perfect prize if you beat me. Izzy would love it. I shudder to think what he would do with this smiling face of the Mets once it’s attached to his hand. Back The Mets Won’t Trade Bartolo Colon, But Should They? Steve Hussy has been a Mets fan since 1984. An insomniac as a kid, he watched baseball highlights at 4 AM on British TV. He credits Darryl Strawberry's long homers as the first cause of his obsession with the Mets. Now he gets to watch Mets games that finish at 3 AM and teach bleary-eyed lessons to his film students the next day. He also gets to shell out hundreds of pounds to fly over to New York and watch the Mets occasionally win. Steve Hussy's other job is as a writer and editor for Murder Slim Press, which specialises in confessional and crime literature. You can find out more about him on MurderSlim.com. Just no threats, please. Yeah, 86-88 seems about right. My preseason assessment was 85-90 and contending for the wild card so I’ll stick with that. Nothing like facing the Mets offense to right the National’s starting staff. The lack of offense feels too much like last year’s team. The bullpen was good the last two games. I’m starting to warm up to Alex Torres. Sitting Flores two games was okay. But it’s time to throw him back in the lineup. No point in playing Tejada regularly, we’ve already been down that road. Even with Tejada, the defense in the 1st inning of yesterday’s game was terrible. Missed two double plays with Tejada messing up the transfer on one of them. There was at least one play that I didn’t think Flores would have made later in the game. But we knew Flores was gonna give up runs while producing more runs. Throw him back in the fire. Gotta right the ship now, hopefully the front of the rotation guys can stop this slide. 86 – seems like a good number, for a number of reasons? I predicted 85 wins when the season began. The good start boosts that to 87 wins for me, but I was always concerned about the hitting, overall, and the defense up the middle. My guess is that within two weeks Murphy will be back at 2B and that Flores will be given the chance at SS for another three weeks or so. Then Reynolds will be brought up to play there most of the time. Wright and d’Arnaud coming back will help the offense a bit, and Granderson will be a little better this season. I like Cuddyer until Conforto is ready. I’m hoping that Gee and Niese get traded, with a better SS coming in, with Syndergaard and Matz replacing them by June. I used to like Murphy, but I don’t like how he doesn’t run hard much of the time to 1B, despite his “reputation” as a hustler. And Herrera looks like he will settle down and hit eventually, but that’s not a sure thing. But they can always move Flores to 2B, and I think he’ll hit and field well enough there. As for Lagares, he hit in the minors and will continue to do so in the majors. I was at 80 wins in the preseason. I am leaning towards 82 now. It is the lack of positional depth, especially in the outfield, that scares me. The Mets are one pulled muscle from Mayberry as a starter. Plus I can see the Mets dumping salary which will eat up their starting pitching depth. I’ll be an optimistic Mets fan for a change. With some moves and a possible trade(s), I’ll say that they’ll go 92-70. 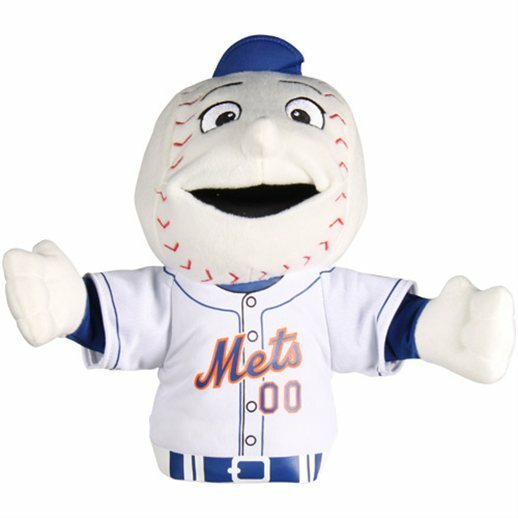 If I’m right though, I don’t want a Mr. Met puppet! I hate Mr. Met. I’m impressed by your bold prediction, CFPunk. Frankly, I hope you’re right. And, don’t worry, I won’t send a Mr Met. There’s all manner of other bizarre Mets merchandise you can choose from. It’s a little hard to predict because we have no idea what to expect from the injury prone David Wright and Travis d’Arnaud. If those two can come back and remain in the lineup for the rest of the season, I still believe this to be a 90 win team . Without that assurance I will settle on 87 wins. Don’t be surprised if there is an upcoming rotation shakeup. The young arms are raring to go. I am a mix of R. and DanB…started at 84…will move to 86, which does have a nice ring to it for the over 40 crowd. I miss the irrational passion of Izzy! I think the Mets still have a great chance to win 81-82 games. Joe + 4 = 86. I’m really hoping the theory holds weight as I could do with the money. It’ll be interesting to find out. I half-expect Izzy to show up and predict 74 wins.